Housing stocks are on fire after a bruising 2018. 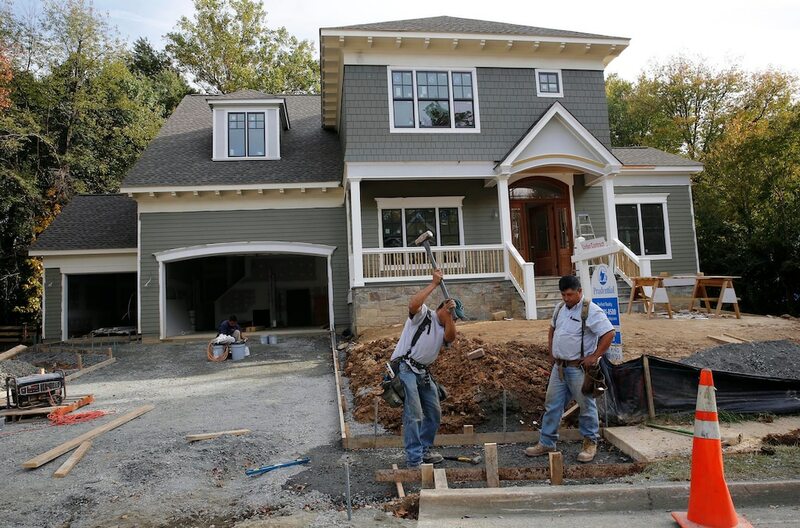 Popular exchange-traded funds full of big homebuilders like Lennar and D.R. Horton are up nearly 20% year-to-date — even as some of the underlying data is lackluster. Analysts and economists are encouraged by what they see as a relatively strong fundamental backdrop. Watch the S&P Homebuilders ETF trade live. Housing stocks have managed to claw their way back from the depths of last year’s bruising sell-off even as the industry’s underlying data leaves much to be desired. It’s not difficult for investors to see how easily homebuilder giants like Lennar and D.R. Horton have bounced back after plunging at the end of 2018. They’ve both jumped about 20% this year, handily outperforming the broader market. The S&P Homebuilders ETF, meanwhile, has logged a similar gain. Analysts and economists tracking the space point to a few reasons for the comeback. First, homebuyers are less concerned with the threat of rising interest rates after the Federal Reserve signaled it’d stand pat for the rest of the year. Falling mortgage rates are also seen as encouraging buyers back into the market. Rates on 30-year fixed-rate mortgages this month fell to their lowest since February 2018. And the homebuilder stocks themselves were seen as having fallen too far, too fast. At last year’s December low, the group was off 35% from its 2018 high. Additionally, it’s the start of the all-important spring selling season. So while a disconnect has cropped up between the stocks’ impressive gains this year and some of the dismal data like housing starts, homebuilder sentiment, and home prices, analysts say the broader housing picture isn’t breaking down just yet. “People left the group for dead,” said Jack Micenko, a housing analyst at the financial-services firm Susquehanna, in an interview last week. Still, the data doesn’t look very inspiring. Home prices rose at the slowest annual pace in four years in January. A month later, housing starts dropped to a nearly two-year low. And in March, a measure of homebuilder sentiment was unchanged, slightly missing estimates. But the data hasn’t all been bad, Single-family home sales jumped in February to the highest level in nearly a year, up 0.6% since the same time a year ago. That measure tends to be sensitive to mortgage rates. “While housing data has been a bit soft, it is not yet problematic,” Jonathan Golub, the chief US equity strategist at Credit Suisse, said in a note to clients on Monday. 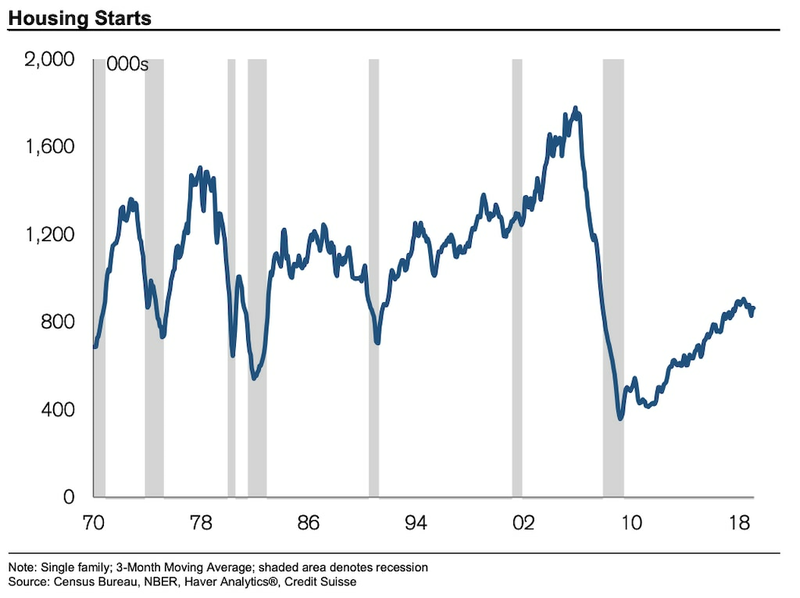 He cited this chart, below, showing housing starts dipping but not dramatically so. Some analysts say demand across some housing markets in the US is improving. Bank of America Merrill Lynch analysts recently visited three major homebuilding markets in Texas to gauge how demand trends were playing out. They were encouraged by visits to Dallas-Fort Worth, Houston, and Austin.